Van Isle Marina is looking forward to welcoming you onboard our boats during the 29th annual BC Boat Show, happening May 2-5, 2019 at Port Sidney Marina in Sidney, BC. 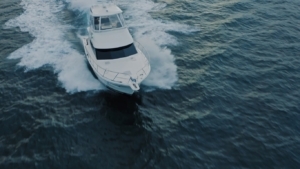 Hosted by the British Columbia Yacht Brokers Association (BCYBA), the BC Boat Show draws huge crowds of enthusiastic boaters from British Columbia, Alberta, and Washington state. More than 200 boats will be on the water and for sale during the BC Boat Show, returning to our quaint, seaside town of Sidney. Van Isle Marina is excited to be showcasing the 43’ Riviera Open Flybridge 2019 and 32’ Back Cove 2018 at this year’s event. The Riviera 43 Open Flybridge is classically designed and extremely easy to operate. It’s perfect for fishing or blue-water cruising and features three levels of living space and large cockpits. The 43 has two designer staterooms, two bathrooms, a full galley with a breakfast bar, saloon, optional laundry, side decks, optional BBQ area, and plenty more handcrafted, well-designed features. The flybridge stair ladder ascends to a bright, airy, open flybridge with a hardtop, regular lounge, L-shaped all-weather forward lounge, wet bar, and spacious flybridge helm. As for propulsion, the 43 Riviera Open Flybridge is equipped with a Volvo Penta Inboard Performance System (IPS). Cruising at 28 knots with a top speed of around 31 knots, the 43 Open Flybridge has a range of 340 nautical miles from its 476-gallon tank. The integrated joystick control makes handling in close-quarters simple and delightful! Step inside the 43 Open Flybridge at the BC Boat Show to experience everything this modern luxury motor yacht has to offer, including two 12″ Garmin Glass Bridge GPS screens, integrated GRID controller autopilot helm, Garmin GSD 26 CHIRP sounder and transducer, and 4 KW Open Array Radar. The 32 Back Cove 2018 is an award-winning, head-turning Downeast-style luxury motor yacht with classic good looks and exceptional fuel efficiency – from a single-diesel Volvo D6 370 mhp electronically controlled engine. Owners appreciate this model’s modern straight-forward systems and expert construction. This vessel’s single-level deck from transom to companionway brings the social spaces of the cockpit and pilothouse into one, with a private master stateroom below. The 32 Back Cove is modeled after distinctive early Maine lobster boats. It was designed with customer-preferred design features in mind, building on the same concepts that the brand has become known for: motor yacht cruising in affordable and easily maintained yachts. You’ll be impressed with the Back Cove 32’s practical elegance and lines of this Downeast-style motor yacht. For the 32 Back Cove, skilled boat builders crafted a warm and inviting interior using American cherry, finely finished with satin varnish. This award-winning, head-turning model comes equipped with the factory optional hardback enclosure for comfortable year-round cruising, and many more add-ons are available. Van Isle Marina is the exclusive dealer of Riviera and Back Cove Motor Yachts in Western Canada, and we love showing off these models every chance we get, including at the upcoming BC Boat Show! 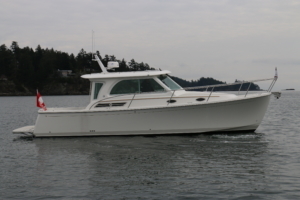 To learn more about these boats and others, we hope you will join our brokers and thousands of other boating enthusiasts in Sidney for the BC Boat Show. Come for the boats, stay for the amazing amenities and views Sidney has to offer. Tour a wide selection of power and sailboats on the water. Learn from on-site yacht brokers who are ready to answer your boating questions. Walk through the tented pavilion on land for a wide selection of outboards, dinghies, navigation equipment, fishing gear and more. Take a break with a visit to the snack bar and the floating beer garden. Meet and network with other enthusiastic members of the recreational boating industry. “Sidney is a unique and exciting seaside town on Vancouver Island and is at the centre of the most beautiful recreational cruising waters in the world. We have plans to make this more than a boat show – more like a festival for all to enjoy,” says Steven Threadkell, BC Boat Show manager of this year’s event. We look forward to seeing you at the show! If you’ll be coming for the show from out of town, we hope you will also make the trip up the coast to Van Isle Marina so you can see all of the yachts we have for sale right now – we are located just 3 km north of the host marina for this year’s show.